A&E departments across England performed worse than ever before last year, official figures have today confirmed. 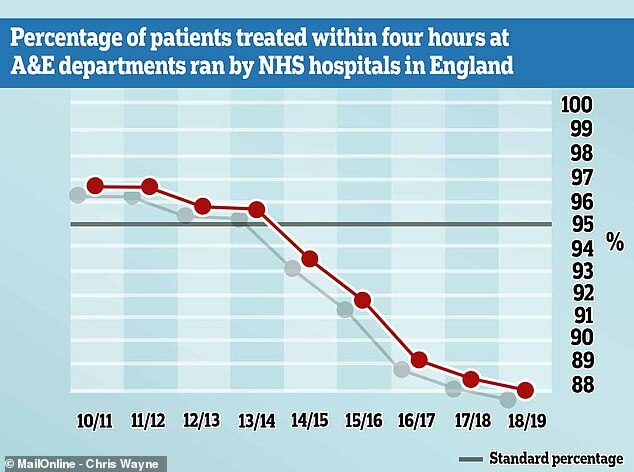 Between April and March, 88 per cent of patients were treated or admitted within four hours – the lowest since figures were first collected in 2004. However, the number of people seen in A&E within the time target was higher in 2018/19 than ever before because of a record number of attendances. It comes amid controversial plans by health officials that could see the national target of treating 95 per cent of patients within four hours scrapped. 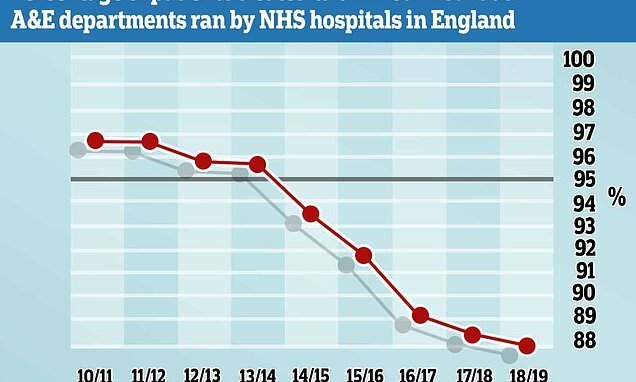 The NHS England data today showed the overall A&E performance in improved in March, after February was branded the worst ever month. However, still only 86.6 per cent of patients were treated within four hours, compared to the record low 84.2 per cent recorded the month before. The 95 per cent standard has now not been met since July 2015. And March was found to be the second busiest ever month in A&E units across the country, with a total of 2,166,308 attendances. Of those, 329 patients were forced to wait longer than 12 hours to be seen – the equivalent of one patient in every 6,500 who attend casualty. Nearly three millions patients (2,975,637) who attended emergency departments were not seen within the target time period over the 12 months. NHS England last month began the process of scrapping the four-hour maximum A&E wait target to replace it with new ones. 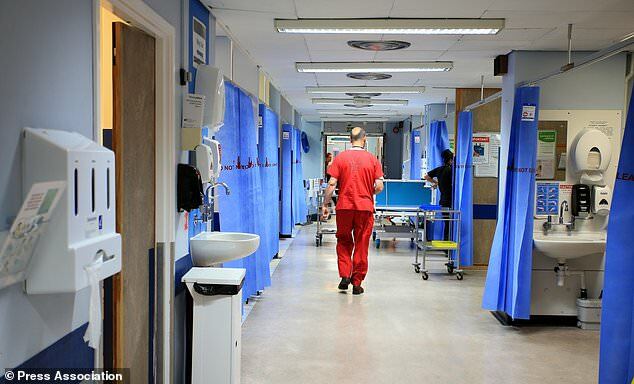 In place of its infamous four-hour target, the NHS has now began trialling seeing the most seriously ill patients – strokes and heart attacks, for example – within one hour. ‘Now is the right time to look again at the old targets,’ the NHS’s medical director said at the time. Tim Gardner, senior policy fellow at the Health Foundation, warned that parts of the NHS are ‘creaking at the seams’. He said: ‘The record number of people treated within the four-hour target over the last 12 months is testament to the huge efforts of NHS staff. And he added it is ‘becoming untenable’ for the NHS to maintain quality of care in the face of ever rising demand from patients, funding issues and staff shortage. He fears the Easter bank holidays will only cause more havoc for an NHS already under ‘relentless pressure’ and working flat out. Pauline Philip, national director of emergency and elective care of NHS England, praised staff for working ‘tirelessly’ throughout winter. The data comes as the NHS prepares to pilot new targets which could lead to changes in the way A&E performance is measured. Under the plans, patients with the most serious conditions will receive rapid treatment within an hour, while people with minor conditions can expect to wait longer. The proposals have faced criticism from some, who say targets are being abandoned because they can no longer be met.